One of the most exciting discoveries in Saturn's rings from Cassini was the appearance of a corrugated, raised spiral in Saturn's D ring discovered by Matt Hedman in 2005. The cool thing about this spiral, unlike the many spiral waves scattered throughout the rings, is that it is gradually winding up, so one can extrapolate from the current state of winding back in time to when the spiral must have been originally created. And it was only 25 years ago. 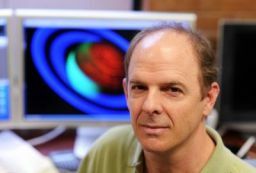 The conclusion drawn by Hedman and his colleagues on the Imaging Science Subsystem (ISS) team was that a large impactor disrupted the D ring, an otherwise faint ring that doesn't usually get much attention, in 1984. Very cool: a recent impact in the rings that produced a large-scale ring structure that we can see changing year-to-year under our (or more accurately, Cassini's) very eyes. The rings are lettered more or less in the order that they were discovered, not in their order from Saturn. (Their actual order from Saturn is D, C, B, A, F, G, E.) When we think of Saturn's rings, we are usually imagining the globe of Saturn surrounded by its brightly reflective disk. This disk is composed of two rings, the outer A ring and inner B ring, separated by the Cassini Division. The C and D rings are much fainter and located closer to Saturn than the A and B rings. The lighting geometry in this image is extreme. It was taken just hours before equinox, mostly of the C ring, one of the dimmest of Saturn's main rings. The B ring's inner boundary is on the right; the C ring's Maxwell gap (demarcated by two bright arcs, which are bright because they rise above the ring plane) is on the left. There is a periodic brightness variation in the image. The side lighting geometry means that brightness variations mostly result from changing slopes of the surface of the ring plane due to out-of-plane disturbances in the rings -- in layman's terms, the rings here are corrugated like a washboard. Previous images had revealed these corrugations in the D ring (located off the view to the left). This image reveals that the corrugation extends beyond their origin in the D ring (which begins not far above Saturn's cloud tops), right through the C ring, to the inner part of the B ring, the densest of Saturn's rings, covering a distance of 17,000 kilometers. This is a wholly unexpected observation that the science team is now working to understand. But that's just the prologue to an amazing discovery. Before I get to the amazing part, though, I need to explain what is going on to produce the spiral in the D ring in the first place. This spiral is a warping of the ring. Think of a sombrero that is twisted around its center, so that it makes a spiral wave. If the ring is warped, it means that particles are on orbits that are inclined to Saturn's equatorial plane. So if the D ring gets tilted somehow, say by an impact in 1984, that really means that all its particles are on inclined orbit. If Saturn were a perfect sphere, then our story would end there: we would see an inclined ring and suspect that something at some point had made the ring inclined, but we would have no way of knowing when or how. But Saturn is a highly flattened planet. It's a floppy gas bag of a planet with a density much less than water, roughly ten times larger than the Earth, and spinning once every 10 hours. This flattened shape causes inclined orbits to precess, or wobble, with a faster wobble for orbits closer to Saturn. So if a broad ring is tilted, its inner edge will wobble faster than the outer edge, causing the ring to twist up into a spiral. As time goes on, the spiral gets more and more tightly wound. This rate of tightening of the spiral can be calculated quite accurately from our knowledge of Saturn's gravitational field and is what allowed Hedman and his colleagues to figure out how long ago the D ring spiral would have been completely unwound. Now we're ready for the amazing part. Saturn just went through its equinox, when the Sun crossed the plane of the rings from the south to the north. With the Sun shining edge-on to the rings, even very small tilts in the ring become observable. If the ring is not tilted at all, no sunlight hits it; but a small tilt allows it to be illuminated. 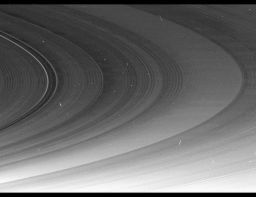 Analyzing images taken near equinox, Hedman noticed that the spiral pattern in the D ring continues into, and all the way across, the C ring. The winding pattern of the spiral matches perfectly across the C ring/D ring boundary. Now, instead of a spiral that is a few hundred kilometers wide and potentially due to an unusual impact in the D ring, there is a spiral that is over 15,000 kilometers from its inner edge to its outer edge! The discovery was only possible due to the unique illumination occurring during equinox. The amplitude of the tilt in the C ring is much smaller than in the D ring, so it was not visible earlier, like the D ring spiral was. The timing remains the same: something happened in 1984 that caused Saturn's rings to become tilted relative to Saturn's equator. And this "something" had to have happened within a few weeks, according to Matt Tiscareno, one of the co-authors of this work. What are the options? Either the rings were tilted, or something inside Saturn responsible for defining its net gravitational equatorial plane tilted. Neither one is something that would seem plausible. Ordinarily. But the observational evidence here is compelling. Tilting that broad a region of the rings (which are made up of countless small particles) is not easy. I can't think of any way to do that. A large object passing through the ring would not produce the kind of initial tilt that would lead to the very regular spiral pattern across the entire C ring as observed by Cassini. The alternative, odd as it may seem, is that something shifted inside Saturn in 1984 that, within a few weeks, caused the net gravitational equatorial plane of the planet to shift from one orientation to another. The rings were then essentially tilted, and the spiral winding began. The mysteries of Saturn's rings will require more observations and some innovative models to untangle.